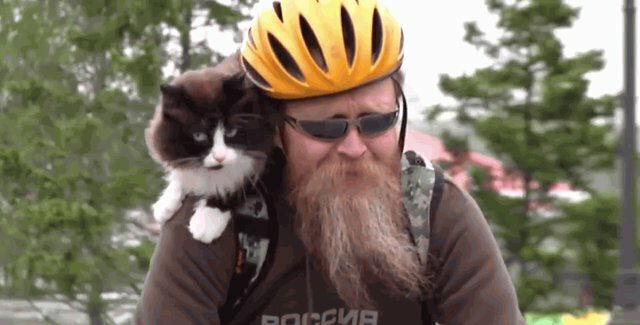 Morda is a big cat -- and now that the weather is warming, his owner Vladimir Ilivanov wants to help the kitty slim down by cycling. The plump feline doesn't burn calories by pedaling with his paws, but by clinging to Ilivanov's neck, Morda has lost about 5 pounds. ‘For him it's like horse riding,' Ilivanov quips. "He is very sensitive and knows that he can cling on with his legs around my neck but he never sinks his sharp claws into my flesh. Morda has accompanied Ilivanov on biking trips across Russia, and they're "training for a marathon in Siberia this year," the cyclist says.